Orbital ATK’s Cygnus spacecraft, the “Deke Slayton II”, has completed unberthing and separation operations from the International Space Station following a highly successful OA-4 Return To Flight mission. The ISS crew released Cygnus at 07:26 EST (12:26 GMT) on Friday morning after 72 days of docked operations – with Saturday marking her destructive re-entry. The OA-4 Return To Flight (RTF) mission for Orbital ATK has, across the board, been an unprecedented success for the company as it debuted its new Enhanced Cygnus module for commercial resupply missions to the ISS. 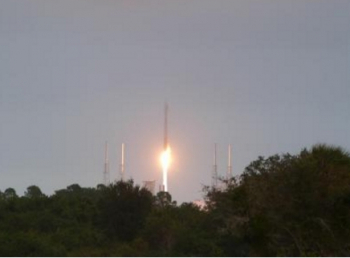 Launched on 6 December 2015 aboard an Atlas V rocket, the launch of OA-4 marked the first time two commercial companies cooperated for an International Space Station resupply mission. With a liftoff weight of 7,492 kilograms (16,517 lbs), the OA-4 Cygnus became the heaviest payload ever launched by the Atlas V rocket. Inserted into a perfect orbit, Cygnus spent the next three days on approach to the ISS, before performing rendezvous and proximity ops with the Station on 9 December. Following these operations to nudge Cygnus close enough to the ISS to be grabbed by the Space Station Remote Manipulator System (SSRMS) robot arm, NASA astronaut Kjell Lindgren grappled Cygnus at 11:19 UTC and gently berthed the vehicle to the Node-1 Nadir Common Berthing Mechanism (CBM) port at 14:26 UTC. 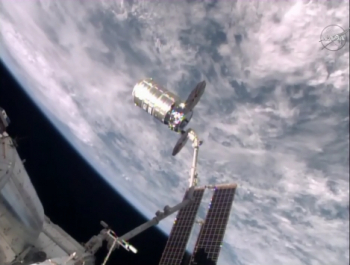 This marked the first time Cygnus was berthed to the Unity node on the ISS. Since berthing, Cygnus has spent nearly 72 days attached to the International Space Station, 12 days more than the 60 on ISS day requirement provided for in the contracts between Orbital ATK and NASA. During this time, crewmembers aboard the ISS have unloaded more than 3,349 kg (7,383 lb) of supplies from the vehicle and reloaded it with numerous no-longer-needed equipment, parts, and day-to-day living essentials that have since been resupplied by other visiting vehicles. 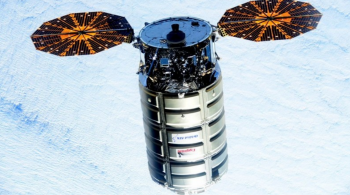 And throughout this entire period, the first version of the Enhanced Cygnus to fly in space has performed admirably and spectacularly well, earning the praise of Orbital ATK’s Frank DeMauro, Vice President of Human Space Systems and Space Logistics & CRS Program Director. All of the upgrades and size configuration changes for the Enhanced Cygnus were in the works and planned for debut on OA-4 before the Orb-3 launch mishap in October 2014. According to Mr. DeMauro, the only change made for OA-4 and Enhanced Cygnus was figuring out the optimal way to load all of the cargo the spacecraft was now capable of carrying to ISS. 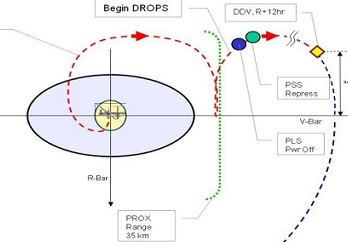 Regarding the entire flight of the vehicle, Mr. DeMauro said that “Launch injection was great and the spacecraft has performed as good as we could have expected. “There were several firsts for this vehicle and this mission, and it all just went extremely well,” praised Mr. DeMauro. With Cygnus now at the end of her OA-4 mission, the vehicle was unberthed from the International Space Station and set free for a destructive plunge and End-Of-Mission (EOM) dive into Earth’s atmosphere. To accomplish Cygnus’ departure, ISS management cleared the vehicle for unberthing, after which crewmembers aboard the ISS completed vestibule depressurization prior to releasing the 16 bolts that have secured Cygnus to the ISS for the last two months. The 16 bolts were driven in two stages while the SSRMS held a firm grip on the spacecraft. Then released, Cygnus was carefully translated 10 meters away from the Station and eased through a series of pre-planned maneuvers to position the “Deke Slayton II” into its release stance. Once Cygnus is in position and the “go” is given, the Latching End Effector on the end of the SSRMS drove its snares to literally let go of Cygnus, allowing her to be free once again. This was followed by the ISS crew, from their viewing position in the Cupola’s Robotic Work Station, slowly moving the SSRMS away from Cygnus. At this point, with Cygnus maintaining an ability to perform abort maneuvers to rapidly, but safely, back away from ISS, Station controllers at MCC-Houston and Orbital ATK controllers at MCC-Dulles conducted a series of system checks prior to Cygnus’ opening departure burns. 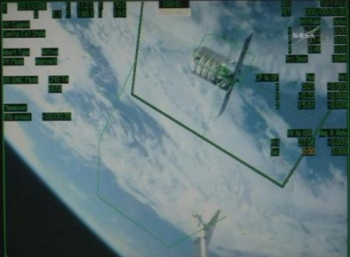 These departure burns began with a commanded abort, a nominal procedure that allows the HTV console to inform Cygnus that she can begin to move away. Cygnus uses several of the same systems for rendezvous and separation as Japan’s HTV spacecraft does – hence why the HTV console will be used for Cygnus’ departure. Cygnus then headed out of the Keep Out Sphere, before eventually departing the Approach Ellipsoid, marking the point where joint operations between NASA and Orbital ATK ended. Orbital ATK’s controllers in Dulles then took control of Cygnus for the remainder of her Low Earth Orbit journey. Once at a safe distance from ISS – and once all Orbital ATK post-ISS separation maneuvers and test objectives are complete – Cygnus conducted two standard burns followed by a final deorbit burn – which took the spacecraft toward a destructive re-entry, with break up occurring high above the Pacific Ocean at 75 km in altitude. 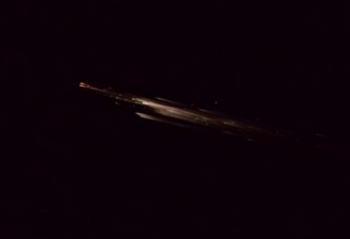 The two stage destructive re-entry took place on Saturday. Following completion of the OA-4 mission, Orbital ATK plans to follow next month, at the earliest, with the OA-6 Cygnus mission – which will again launch on an Atlas V 401 rocket from the Cape Canaveral Air Force Station, Florida. 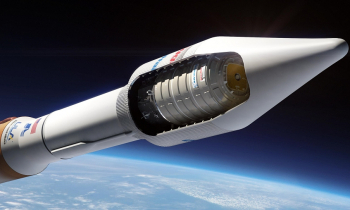 At present, Orbital ATK plans to perform the OA-5 mission this summer, which will see the company return Cygnus launch operations to the company’s Antares rocket. The successful completion of the OA-4 mission marks a period of increasing activity for Orbital ATK as they fly out the remaining extended CRS-1 contract for NASA and begin operations to fulfill the newly awarded CRS2 contract, which will see Cygnus perform numerous resupply trips to the International Space Station through 2024.